Every year Donnie and I love to dress up and head downtown for what never fails to be the best amazing people watching night of the year. I always tend to pick my costumes by makeup. I love to play with makeup and Halloween is the perfect time for me to indulge. Donnie, on the other hand, tends to pick a costume day of and usually bases his decision on materials available or whatever slim pickings are left at the costume store. Here’s what we chose this year. 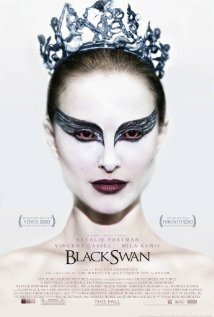 This year I dressed up like Natalie Portman’s character as the Black Swan from the movie, Black Swan. The makeup for this role was epic and I was dying to recreate the look. 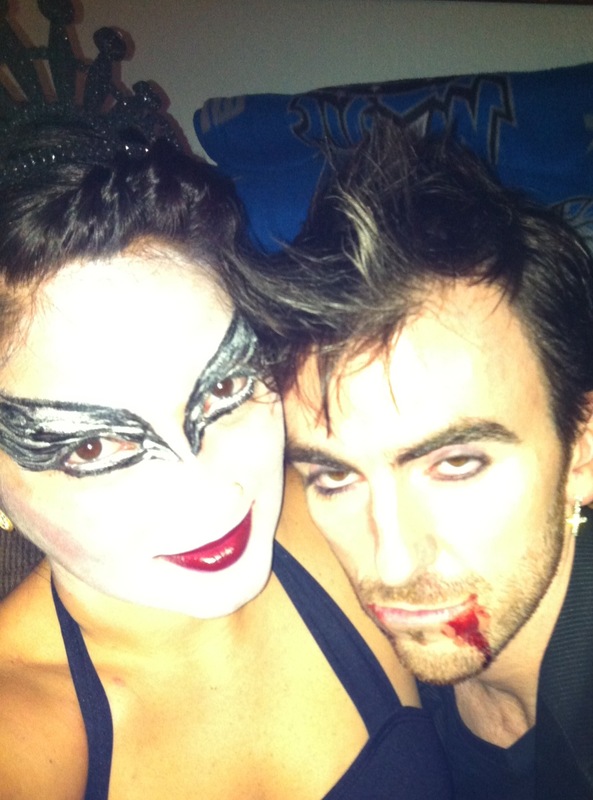 I had some leftover white costume makeup that I used for my face to get that pale look. I used my regular makeup to create the eye portion: black waterproof liner, black pencil liner, silver pencil liner and silver liquid liner. On my cheeks I used cheek stain and on my lips a dark red lip liner with black pencil liner for shading and a ruby red lipstick to top it off. On Amazon.com I found a black halter leotard and a black tutu. I chose the halter style for the added support and I got lucky because it’s super comfy and I can pair it with sweat pants for strength workouts or yoga (which is on my TO-DO list). I had to search the Fashion Square mall high and low for white opaque tights (I found them in the very last department store I walked into). By the way, white tights are not flattering on my body type at all, but I was trying to stay true to the costume. Needless to say, I won’t be wearing these again. For shoes, I wore my pink flats from Aldo, which resemble ballerina flats. The tiara I got for $1.99 at Party City. I picked it up in the kids birthday section and popped the purple stones off that were on it. As for Donnie, he left all brainstorming for a costume until the day of as usual. I’m not sure why, but the cult vampire flick The Lost Boys popped into my mind. I suggested he go as Keifer Sutherland’s character in the movie, David. Donnie loves that movie and quickly got excited. Although he didn’t have any luck finding the blonde wig that would’ve completed the look, he picked up some fangs and some fake fingerless leather gloves at one of the costume stores. And while at Target, I completed the look with some $4.99 cross earrings I found at Target (I was there trying to find the white tights). He wore a black t-shirt and jeans and I tried to mold his hair into a mock mullet. We added some leftover fake blood leftover from last year and his look was complete. What did you dress up as for Halloween? Did you plan ahead or decide at the last minute? My halloween costumes are always conceptualized by my beautiful girlfriend…so I generally just wait until she comes up with something. She always pulls through in the clutch!